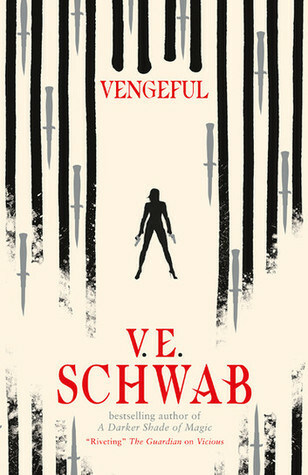 I wasn’t wrong when I chose Vengeful as my first read of the year. It started out the year with such a bang, I’m not sure my next read would be able to follow. Vengeful sets 5 years after the event in the Vicious, where Victor still lives with Mitch and Sydney but now dealing with something that might be even out of his control. Meanwhile, Eli is in the prison and has to deal with someone who murders EOs like he used to do. In the middle of this, came a new player. All Marcella wanted in life was power, but she was constantly undermined and belittled as women. Now she that she got it, she plan to use it to take vengeance and remake the city in her own image. Reading this book was a ride. From the first chapter, I know it’s going to be my favorite. There are three story lines, all seemed separate at first but it collides beautifully in the end. The stakes are high in this book, especially for Victor, but since it focuses more on Marcella, her raw power and fiery spirit rubs off on the atmosphere that it was filled with tension and excitement. There were parts where I just wish we would stop seeing about Marcella and more on Victor and Eli. After all, this is why I initially wanted a sequel for Vicious: the aftermath of the duel on the characters involved. I still wanted more of our old characters, especially Victor, Mitch, Sydney and Dol, however I’m also glad with the amount of Marcella we got. She took femme fatale to a whole new level, but at the same time, she also only takes what’s due on her effort of making his husband empire and being ignored just because of her gender. Her story is not far off from our reality, and when she got her payback, despite being a bit cruel, it also felt a tad bit satisfying. Marcella’s sidekicks are June and Jonathan. I was hoping more from June as she’s intriguing and presents a tempting alternative to Sydney. However, I’m not sure what does Jonathan’s part is in the story other than completing the “rule of three” in the story. Being in each other’s position does wonder to Victor and Eli’s perspective, but they are still ruthless, cunning, and intent on finishing each other. Eli would do anything to escape and finish what he started, and so does Victor. We got a bit more of backstory about Eli in this story, and it’s interesting to see his layers fall away, on how his past shape who he is now and the way he carries himself. “He hadn’t been asleep, she realized. Victor, as always, is my favorite. Maybe because we’ve been inside his head for so long, I just feel more connected to him and his way of thinking. In this book, he has a personal and “familial” conflict. When dealing with his personal, as always he’s quite ruthless. But when dealing with the familial? Can we appreciate domestic!Victor???? Like, he’s not exactly warm and cuddly but it’s so adorable seeing him protective with the people he actually cared about. This is what my dreams are made of and I can’t get enough of these moments! Having watched Interview with the Vampire and Orphan, I guessed from the first book that Sydney’s not aging will bring a problem later in the story. Not only that, but she was also a child on the run with minimal contact with society. It’s interesting how everyone is trying their best to not only lay low, but also do what’s best for Sydney. I love Dom and Mitch too, they are awesome and super nice to see them again! The final fight was epic, there was something that felt anticlimatic but overall, it was exciting to read. And as my goodreads review said, Victor and Eli fighting together on the same side IS what my other dreams are made about. They work in sync without communicating and watch each other’s back even though it’s only so they’re not dead without the other’s consent. My most anticipated release in 2018, I couldn’t find the right time to read it so I’m determined to make it my first read of the year. Was it as good as I hoped? Yeah it was, even though some parts were different from what I thought. It still explores about the good and bad of humanity, about women and power, about family and your past, and also, vengeance. As with Vicious, it leaves an open ending and I would be 10000% down for another, and hopefully, final book in the series. Great review! I’m so excited to read this one. Vicious was spectacular and I need to bump this one up on my list! Ugh yes please read it, it was amazing and I hope you’ll love it as much as I did!